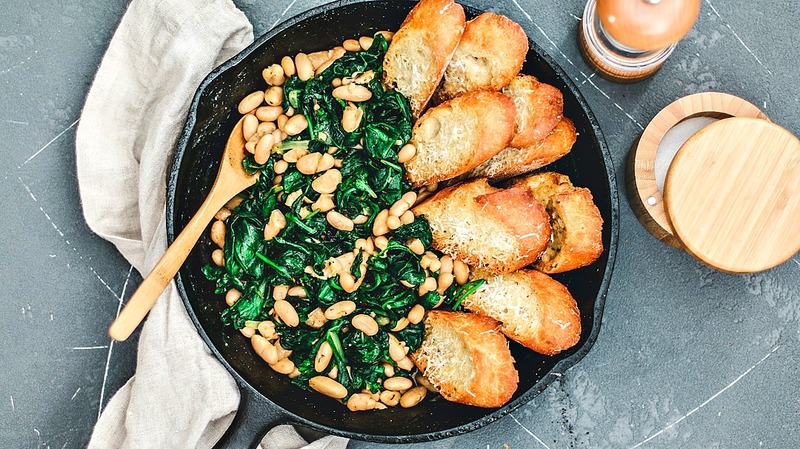 Beans and greens is a humble Italian dish that brings you sautéed and garlicky wilted spinach with tender cannellini beans. Serve it with parmesan toasts for an awesome appetizer. Beans and greens. It doesn’t sound exciting, but I can guarantee that your first mouthful won’t be your last. I was introduced to this humble Italian dish a few years ago at a sweet little restaurant in Gibsonia, PA. My in-laws took us out for dinner and, when ordering starters, they opted for the “beans and greens”. I’d never heard of the stuff before, but it was a far cry from my usual Italian starters—like tender breaded calamari or a refreshing Caprese salad. I didn’t think I’d eat much of the stuff; my knee-jerk reaction was a bit judge-y, I’ll admit it ;) But dang. Once I scooped those tender garlicky greens and hearty beans onto some bread and into my mouth… I could not stop. Where had this been all my life? Beans and Greens With Buttery Parmesan Toasts. You can use SO many different greens in this recipe. I kept it simple and approachable with baby spinach. You could add kale, escarole, broccoli rabe, or any combination of those gems to the mix. Since we like spice in this house, the addition of chili flakes in this recipe is welcome. If you’re not into heat, you could omit the chili flakes completely. You’ll still end up with a mouthful of savory, garlicky goodness. We like to use this dish as a starter to Italian main courses. It’s a nice break from the usual salad and it gives your hunks of fresh bread a new purpose. We slather our baguette slices with garlic butter and top them with freshly grated parmesan before toasting them in the oven. But! Feel free to create your own version. Plain ol’ garlic bread would be great, and there’s definitely no harm in keeping the bread uncooked in it’s simplest, freshest, and fluffiest form. This dish would pair amazingly with my Lemon Pasta With Arugula or my Tender Turkey Meatballs With Easy Marinara Sauce. Beans and Greens are a heart-healthy and nutritious classic Italian dish. Serve with buttery parmesan toasts as a starter to your face Italian main! 1 lb (give or take) of baby spinach or other healthy leafy greens (kale, broccoli rabe, escarole, etc.) If you use kale, be sure to remove the thick woody stems and ribs. Heat 4 TBSP of the oil in large skillet over moderate heat. Add the garlic and chili flakes. Simmer until the garlic is fragrant (about a minute) stirring frequently; do not brown the garlic, or you'll end up with a bit of a bitter taste. Add the greens in bunches bit by bit. Stir to coat in oil and wait until the greens are beginning to wilt before adding more to ensure proper space and coverage. If you need to, add that extra TBSP of oil. Once all of the greens are cooked down, wilted, and are bright green in color, remove them from the pan with tongs and place them into a bowl; set aside. Add the broth to the skillet and bring to a simmer. Add the beans and simmer, uncovered, until the beans are heated through and the liquid is mostly absorbed—about 3-5 minutes. Add the greens back to the pan and stir. Season with salt and pepper. Before serving, you can top with freshly grated parmesan. Serve with buttery parmesan toasts, garlic bread, or fresh bread. Preheat oven to 375º F. Line a baking sheet with the baguette slices. Stir the garlic in with the melted butter and, with a basting brush, generously brush each slice with the garlic butter. Sprinkle freshly grated parmesan over each slice. Bake in the oven for five minutes. Check on the crispness of the baguettes. You can take them out if you like what you see, or continue to bake them for another 3 minutes. You want to avoid them getting *too* hard and crisp. If you have leftovers, you can keep them tightly sealed in the fridge for 3-5 days. They reheat nicely!